Bad: The map feels a bit empty. Somewhere beyond the sea, Far harbor is waiting for me. War, war never changes. These wise words from the narrator flicker in the back of our heads when we start up our game and notice that the new DLC is installed: “Far Harbor”. As the first big expansion for Fallout 4 that includes a whole new map. In the past new maps were a normality for downloadable content when we look back at Fallout 3 and Fallout New Vegas. 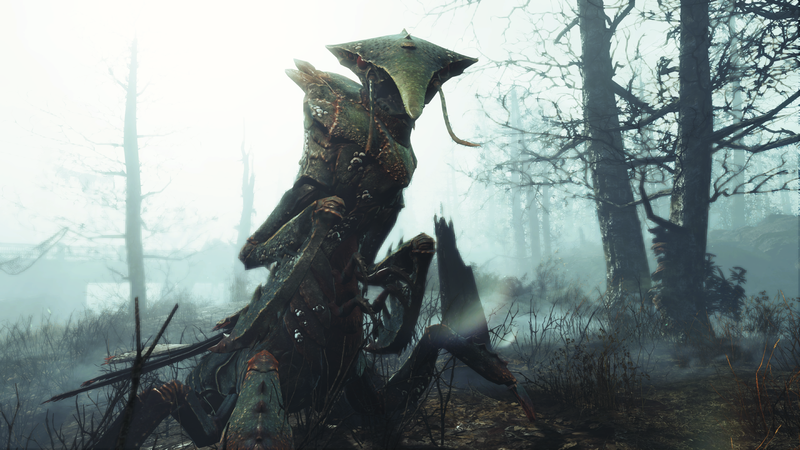 Far harbor is the 3rd and final expansion for the first batch of announced DLC’s, next to Automatron and Wasteland Workshop. When starting up the game we are greeted with the old faithful message that we have discovered a new radio station. This radio station belongs to Nick Valentine and tells us that we are needed back at his office for a new case. Upon arrival you will be presented with the case of a missing person, namely Kasumi Nakano. Nick will inform you that it’s a long walk to the destination from diamond city, and he isn’t lying. Located beyond the borders of the map is the house of the Nakano family. 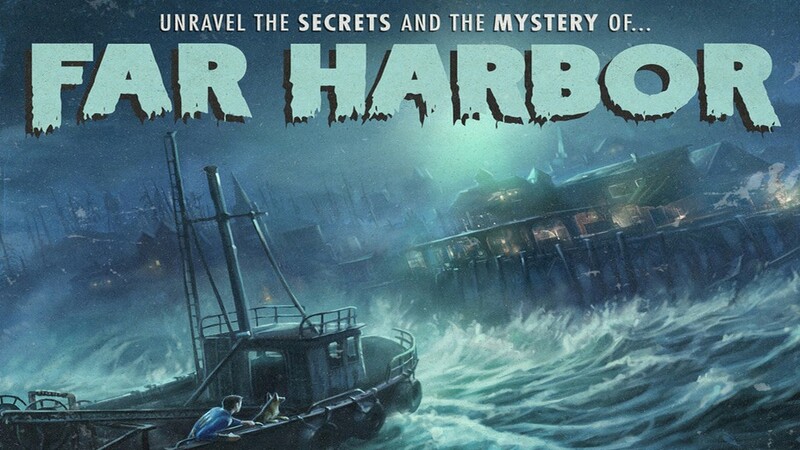 You, the newly crowned detective will need to find clues to know where little Kasumi went, and it comes as no surprise, she went to Far Harbor and thus you borrow a boat and set sail. 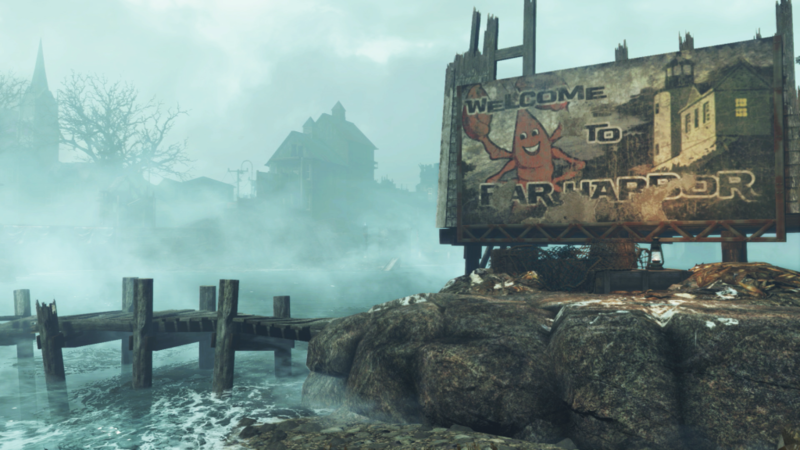 Far Harbor can be a little reminiscent to Point Lookout from Fallout 3: since the setting has the same feel and location. Don’t get me wrong, this isn’t recycled DLC. When arriving at Far Harbor you are greeted by the “friendly” harbor man. Of course, trouble has a knack of following you and soon after your arrival a raid ensues and you will need to defend the town against the many enemies that cross your path. From here on out the quest line unfolds for you to pick up and explore the many interesting places Far Harbor has to offer. Collectors can feast on the many new weapons and armors which are found on the Island. Because of the expansiveness of the map it can take a while before you will be able to fondle possible new toys. Unless you want to unload some caps in the few harbor stores. Legendary enemies and items are also well represented in Far Harbor. Ferocious enemies will try to tear you apart around every corner you walk and the mist is seriously radioactive. To take away some of your grief, we received all new exclusive power armors with unique paint schemes. 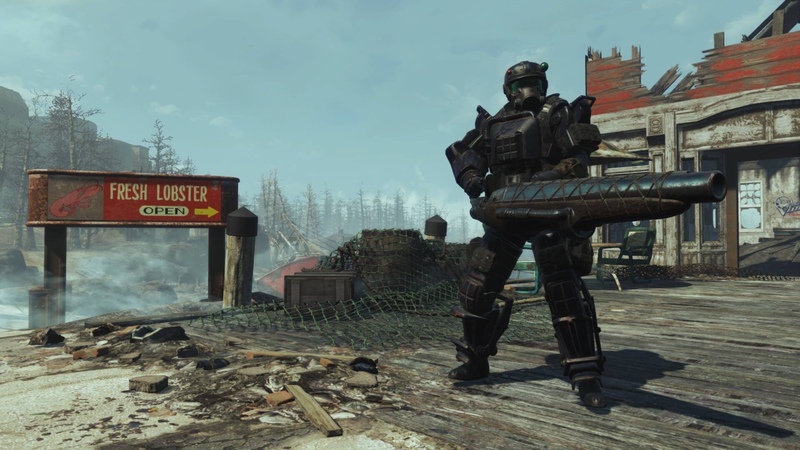 Unlike previous expansions: Far Harbor allows us for a instantly fast travel back and forward to the Commonwealth. You will always spawn at the Nakano Family residence or at the Far Harbor Bay area, respectively where you are traveling from. While we like the new location and love the fact that it’s fairly huge for something that is considered a DLC, at times we felt like the map was a bit empty. Compared to the other Fallout games or even older expansions we came across fewer random encounters. In the past there were many enemies lurking in the shadows, or fun loot to find when traversing from one side to another. This time we felt like we had more time to enjoy the sceneries instead of having something to do. For players who have already cleared a big part of the base game, be sure to check out old characters you’ve done quests for in the past, because some quests can be triggered in the Commonwealth that you need to complete in Far Harbor. It’s fun to see that this is not merely a simple DLC, but that it also offers some kind of integration with the original game. Far Harbor adds a large amount of gameplay to the already long story of Fallout 4. The bulk load of new items will keep the crafters and hoarders happy, but thrill seekers and story enthusiasts will also have their pick of the litter. Rise and shine in new armors and have hours upon hours of discovery and rampage fun.